Discussion in 'Air Force' started by siegecrossbow, Sep 4, 2017. Please visit the following link for previous discussions. Continue all J-20 related discussions here. Equation, Air Force Brat, defenceman and 2 others like this. SteelBird, N00813, ougoah and 1 other person like this. 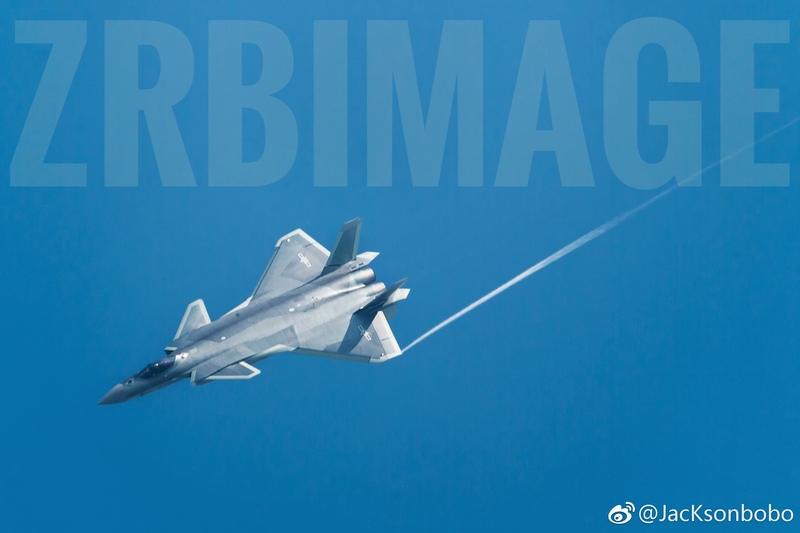 This is the first WS-10 equipped J-20 that we have actual photographic evidence of, it may be a "one off" test bird, or it could be the precursor for the initial production runs. Once they get it into flight test we will know more, I rather imagine the inlets are fine for now as the WS-10 should be very similar to the AL-31FN, and the fact that we've seen no major changes is great. defenceman and Mike North like this. Haven't seen this camo since before Zhuhai last year. by78 and Air Force Brat like this. Only God knows when that time of fully matured engine will be, but the time is now especially nearing made_in_china 2020, only few years away when everything has to be self made from toilet paper to jet engine. defenceman and Air Force Brat like this. WS10x powered J20 is great news because for a long time Indians have laughed hard at China using old Russian engines on its brand new fighter. At least now it's home cooking. bruceb1959, AeroEngineer, defenceman and 2 others like this. Who the hell cares what the Indians think? Their Kaveri engine is mere vaporware ... they should not be the ones laughing. India is completely dependent on Russian sub-systems for virtually all their "indigenous" equipment. China is in the midst of cracking their final frontier : a high thrust turbofan, meaning that even the Russians (don't mention the Indians) have much less to laugh about when it comes to the Chinese military. AeroEngineer, manqiangrexue, Akkarin and 3 others like this. Not just that. But remember the whole Su-35SK was bought to get Saturn 117S for the J-20 hypothesis. Yes the J-20 is very underpowered compared to F119 powered F-22 but the WS-10B gives the J-20 full independence and security. That is overall great news for such a critical platform. Let others laugh. Reality is rarely kind to those who have their heads in the sand. All journeys begin with a single step. At least China have taken steps. Few countries have even gotten off their backsides. India is busy napping while it's laughing at China. In twenty years time, IFF India is lucky and smart enough to have started manufacturing (to a significant export scale) and developing technology, we will see very bad copies of mainstream technology and shoddy quality. This is a big if for a country with about 50% poverty, 60% non literacy, and no sanitation or clean water in almost all non first tier cities. I think J-20's best angle is directly above or below despite it's length really showing. Kinda cool and different. Also seems wings are really small compared to typhoons and rafales. Tiny wings remind me of F-35 wing sizes. These two being two of the newest fighters around, maybe there's something to it. I am part of the group that believes the F-35 to be a great albeit expensive fighter. So the technology employed there is no doubt more advanced than the ones in F-22. Although their roles differ along with performance parameters, maybe there's more to the body lift being talked about in American fifth gen fighters. Maybe Chengdu designers did learn a lot from LM hacks if those actually happened. Pretty sure they did. AeroEngineer, tanino and Air Force Brat like this.